There’s a certain type of movie setup that finds a protagonist, often female, not too far removed from her college years, unsatisfied with the place that she has thus far found for herself in life, and unprepared for an altogether different opportunity that threatens to change everything she thinks and knows. This movie has been made many times before, and while its versions hardly constitute classics, it’s generally a good framework. 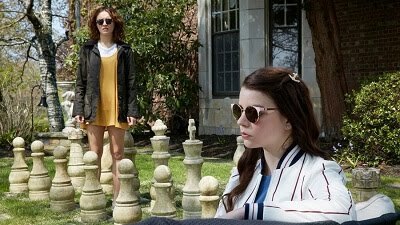 “Backwards,” which arrived on DVD earlier this month after a tiny theatrical release in less than ten theatres for three weeks this fall, is an acceptable if unexceptional take on one young woman’s journey of self-discovery. Sarah Megan Thomas stars as Abi, a rower training for the Olympics whose failure to secure the top slot for the big game prompts her to move home and, at the less-than-gentle nudging of her mother, go find a job. Thomas is best described as a cross between Zosia Mamet and Elizabeth Olsen, giving off a tempered energy that makes her charming but not entirely alluring, seductive at the right moment but never aggressively trying to achieve that aim. Thomas portrays Abi as subdued, honest, and determined, a combination that doesn’t always work to her advantage for the spirited athlete. James Van Der Beek joins Thomas as Geoff, the former classmate and coach with whom Abi has a random run-in and subsequently helps Abi get a job coaching his athletic department’s rowing team. It’s jarring to see Van Der Beek rather ably play a nice guy with his heart in the right place after seeming him parody himself on ABC’s “Apartment 23” each week, and it’s reassuring to see that the actor knows exactly the kind of part he should be taking on at this point in his career. It’s obvious from the start that Abi and Geoff have both a romantic past and a romantic future, and Thomas and Van Der Beek complement each together well and create believable sexual tension and compatibility. Once she attains the job that will inevitably change her outlook on competitive sports and teamwork, Abi is paired with two young rowers, both broadly defined, one as being too overconfident and disrespectful, and the other as shy and lacking that confidence that could propel her to greatness. Their differences are quickly resolved without much time spent on them, however, since the film is much more Abi’s story than anything else. The film’s appropriate PG rating and peppy tagline “Define Your Moment” underscore the fact that it is a family film rather than some sort of adult coming-of-age drama, and, in that respect, it’s a perfectly competent and decent film.